When it comes to her dreams, Antoinette Harris won’t let anyone veer her off the trail she’s blazing. Despite demonstrating her asset to the football team when she first came to East Los Angeles College in 2017, the staff initially had reservations about how a female athlete would fit into the football program at ELAC. At the end of one practice in the summer, the coaches asked her to consider working with the team in another way. “[Her] refusal to be denied is kind of what stayed with me from that little moment,” Tree said. Despite the disagreement, Harris continued to show up at practices and do what was asked of her. The staff realized quickly they were wrong. Head coach Bobby Godinez made the decision to officially let her on the team and she became ELAC’s first female football player. They grabbed a helmet and shoulder pads, brought it to the practice field where Toni was. It was their way of assuring her that she belonged with them. Harris is no stranger to skepticism. She has been watching and playing football since she was four years old, but directed away from playing football many times throughout her life. As a result, she participated in all kinds of activities and sports as alternatives. She has done competitive dancing, cheerleading, gymnastics, and women’s soccer. She also sings. “I kind of did it all,” Harris said. But despite excelling in many other activities, she didn’t let it steer her away from what she truly wants to pursue: football. “They said she was too small. They said she was too slow, too weak…. People have made a lot of assumptions about Toni,” the commercial narrates over a montage of Harris training, weightlifting, running, tackling and intercepting a football. Upon seeing the commercial, Tree felt proud, but was also not surprised. Harris is the first woman to receive a full football scholarship. 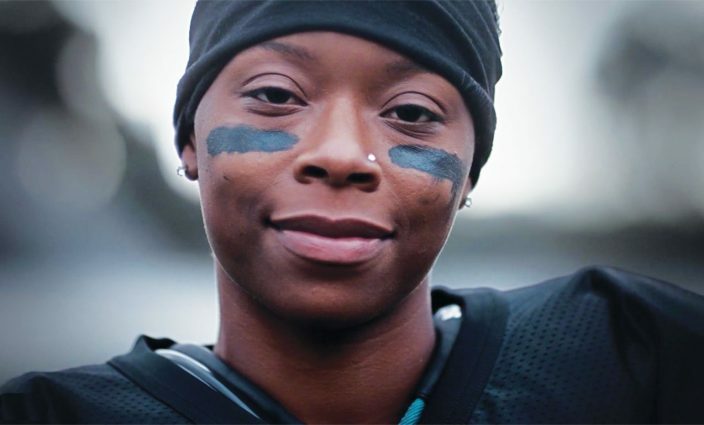 Her dream is to be the first woman to play for the NFL.